Tai Sin Electric has been on my watch list for quite some time and I have been hesitating to buy it since my last analysis on it as the stock price as been rather stagnant at $0.44. (Read more at My Personal Analysis of Tai Sin Electric Limited). Today, I learn something new today called “Market Depth“. 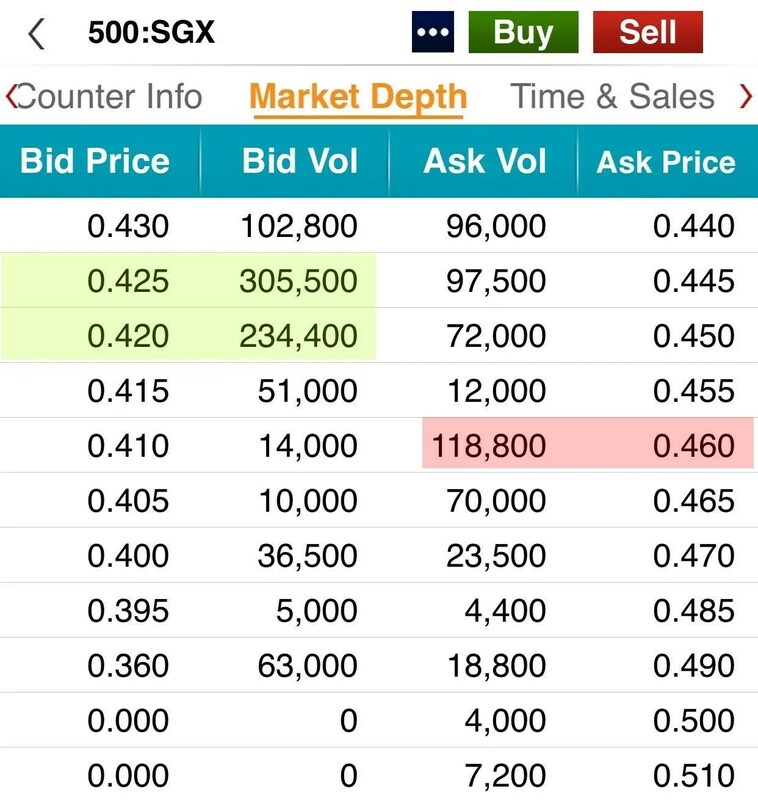 Above is a screen shot of the Market Depth of Tai Sin Electric Limited on 26th May 2017. On the left hand side of the above picture is the bid price and bid volume or in simple terms we call it as “buyers”. On the right hand side is the ask price and ask volume aka “Sellers”. The green colored cells represent the possible support level at S$0.425 and the red colored cells represents the possible resistance level at $0.460. From the above picture, it shows that there is higher buy volume than sell volume and thus this stock Tai Sin Electric Limited is still bullish. Market Depth information is dynamic. This means that the information is only valid for a day or maybe a few hours. It is simply based on supply and demand. When I looked at Tai Sin Electric Limited Market Depth this morning, there is asking price of $0.435 but you notice at this moment, it is gone. Someone has scooped up the queue price of $0.435! The order volume or price may not be accurate. If you see the lowest bid price and highest ask price, you will think how is that possible for the stock price to fluctuate that much within a day. If you place that bid, most like your trade will expire and will not be filled for the day. In conclusion, if I bid Tai Sin Electric Limited at $0.42, it is unlikely for me to get it today because there is no asking price at $0.42. I should bid at $0.44 if I should decide to add Tai Sin Electric Limited to my stock portfolio.